Ed Note: Paint the Town was an initiative sponsored by the Southern Baptist Association in New York City beginning in 2005. In 2007, they asked Jeremy Del Rio to help them reimagine how an evangelical Christian denomination could come alongside public schools in a faith-neutral way. This report, originally written for denominational leaders, summarizes the results. This case study reports on the implementation of Paint the Town 2007 (PTT) and relies on written documentation, first person observations, and interviews with the internal PTT administrative team and external PTT project partners. Visionaries transcend what is familiar to see what the familiar cannot. They perceive the “new things” God does before the rest of us and help others catch up to His plan (Isaiah 43:19). The Metropolitan New York Baptist Association (MNYBA) provided visionary leadership in transforming the already innovative Paint the Town (PTT) service model this summer. There came a need to develop a system of operation that would require fewer staff and less resource without diminishing the diminishing the effectiveness of PTT. MNYBA worked with the Baptist Convention of New York to adapt PTT to new fiscal constraints and at the same time leverage three years of success responding to real city needs by inverting the PTT paradigm, and in so doing multiply its potential for long-term impact. Ironically, in embracing a paradigm shift this summer MNYBA rediscovered PTT’s original vision as inspired in part by the late Rev. Hermes Caraballo. Then the faith-based liaison to Bronx Borough President Adolfo Carrion, Jr., and an Assemblies of God minister, Rev. Caraballo advised the Southern Baptist Convention as it clarified the mission for New Hope New York (NHNY), a three-year outreach initiative of the Convention’s North American Missions Board. Rev. Caraballo had experienced first-hand the disrepair of many Bronx public schools through both his official duties with the borough president’s office and also his affiliation with various South Bronx churches. In response, he proposed a novel partnership between NHNY, a neighborhood church, and the public school where that church met to beautify the facility as a gift to the school’s students, administration, faculty, and families. The resulting good will and tangible manifestation of grace inspired the further development of PTT as a short-term, Southern Baptist missions opportunity that drew roughly 3,000 volunteers into New York City over the next three summers. NHNY provided infrastructure and staff and recruited and trained volunteers from around the country to refresh upwards of thirty schools in three years. But as PTT’s former director Eric Hoenigman reported in August, the centralization of PTT allowed project efficiency without relying on substantial involvement from local congregations. As NHNY negotiated directly with the Department of Education (DOE) to identify particularly needy schools, finding nearby churches to facilitate projects became a tricky, but not insurmountable problem for PTT staff that could fill the gaps. As a result, thousands of short-term volunteers from outside the city beautified dozens of schools inside the city, but the absence of congregational participation in many of the schools left little hope of enduring community relationships with them. With NHNY’s three-year commitment drawing to a close in 2006, MNYBA confronted a dilemma in 2007: how to achieve the same (or better) results with less than half the previous year’s PTT budget and a fraction of the staff. Thereafter Rev. Frost and his team made a series of visionary decisions that insured a long-term legacy for the project. + Visionary Decision 1: Decentralize PTT by awarding grants to local congregations to design and facilitate local projects. MNYBA’s first strategic decision was to utilize its 2007 resources to empower local congregations to design initiatives that met felt needs within their own neighborhoods rather than rely on centralized staff to identify and manage projects. Congregational buy-in became a given as MNYBA empowered churches to allocate PTT grant dollars to address specific issues of concern to their communities. The new system’s flexibility encouraged those congregations to contextualize efforts and to adapt them as needed to changing realities throughout the summer. + Visionary Decision 2: Align PTT with a citywide, interdenominational adopt-a-school strategy. Second, MNYBA aligned PTT with a citywide initiative spearheaded by indigenous youth leaders to encourage New York City’s 7,100 evangelical and Pentecostal churches to adopt the city’s 1,400 public schools for prayer, advocacy and meaningful service. The Coalition of Urban Youth Workers (the Coalition) sometimes describes itself as “smoke, mirrors and lots of grace” because of the support of groups like MNYBA despite the absence of any formal organization, staff or budget. Nowhere was this more clearly evident then when Rev. Frost invited the Coalition to help identify local ministries that had already adopted particular schools, on the theory that if a church is already praying for a school, then PTT would represent an answer to those prayers. What better way to engage schools generally than to become a resource for congregations that had already embraced specific schools? + Visionary Decision 3: Utilize denominational resources for Kingdom purposes by earmarking grants for non-Baptist ministries. Perhaps most radical of all was MNYBA’s decision to designate up to 30% of its grant proceeds for non-Baptist ministries in order to invest in the Coalition’s recommendations without regard to denominational affiliation. This kind of Kingdom mindset expanded Rev. Caraballo’s precedent for the denomination’s city-reaching strategy, and the MNYBA set a high bar both for itself within greater New York and for denominations nationally as they choose to engage cities in the future. The ensuing inter-denominational unity manifested the precious anointing that commands the Lord’s blessing (Psalm 133:1-3). 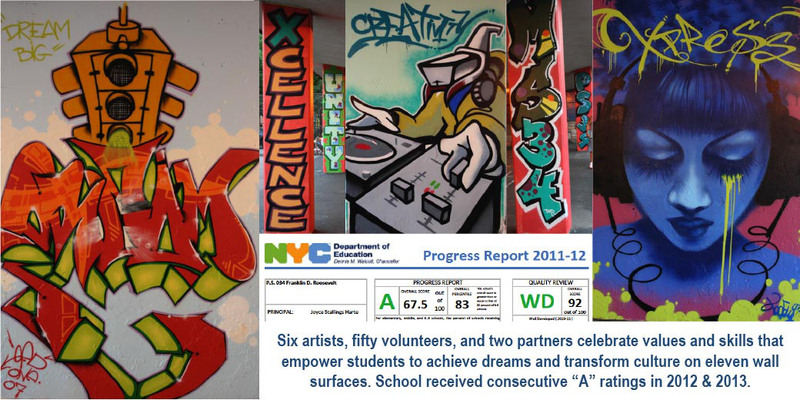 The result was eleven Paint the Town projects in all five boroughs and New Jersey. Some strengthened ongoing relationships between established churches and community schools. Others forged new relationships for church plants. And still others provided opportunities for congregations to rediscover Godâ€™s passion for their neighborhoods. All, however, reported opened hearts and minds that produced what Walter Sotelo of CitiVision called “crazy glue” connections between schools and their sponsoring churches. Jannie Wolff of Abounding Grace described how the influx of Baptist volunteers, primarily from Southern states, prompted onlookers to ask who they were and why they kept coming. As word spread among the school’s staff and the wider community, individuals approached the volunteers looking for prayer. Pastor Ed Perry of Bethsalem Church in Queens described how PTT helped restore confidence in the faith community, and even “shamed” some neighbors to join as volunteers. For the principal he described a conversion of sorts, moving from cynic to a believer in the church’s ability to deliver on its promises. For Gallery Church, a two-year-old church plant who has been involved in this program from its inception, PTT solidified a collaborative relationship with the school where the congregation meets and helped establish visibility within the surrounding neighborhood. PTT enabled Graffiti Ministries to serve not one, but three community institutions, including a local public school, a Catholic school in transition, and a nursing home; and Graffiti’s daughter congregation enrolled eighty children in a sports camp in the Bronx. Prior to PTT, Evergreen Baptist was a traditional ethnic church, self-described as “evangelical but not evangelistic.” PTT inspired the congregation to “walk across the street” to serve a local elementary school beginning with a teachers breakfast in June and continuing with paint projects and neighborhood VBS programs in July. Crossroads Church in Staten Island enhanced its “resume of trust” by painting two schools, including the facility where their church plant meets. Milburn Baptist, a second-year PTT congregation and a two-year-old church plant in New Jersey, commended MNYBA’s willingness to allow it to respond to a specific, non-painting request by the local middle school principal to landscape the school’s front yard. The ensuing six-day project attracted visits from school board members and neighbors and a feature story in the local newspaper. Milburn’s Pastor Bob Griner also marveled at how PTT inspired a largely affluent community that was used to simply “writing checks” to actually serve. Every partner appreciated PTT’s adaptability, which freed them to manifest community creatively in their respective neighborhoods. To this end, Manhattan Bible Church partnered with Inwood Community Center and the local Police Athletic League to close Post Street for daily recreation and family fun; Abounding Grace produced block parties, basketball tournaments, and concerts as part of its Jesus Loves You New York outreach; Evergreen hosted a block party, neighborhood health screenings, and VBS; and Graffiti offered a clothing drive and evangelistic concerts in addition to presence at the Lower East Side’s Loisaida Festival. As the churches demonstrated God’s love for their communities in such tangible ways, people responded, with nearly 100 reported decisions to follow Christ this summer alone, thousands of seeds planted and watered, and relational credibility established. All of the pictures that accompany this report were taken at various PTT functions sponsored by Abounding Grace Ministries (AGM) and Generation Xcel (Xcel) in Manhattan’s Lower East Side. Eleven years ago, thirteen young people ages 14-22 overcame the lack of money, space, equipment, and paid staff to establish Generation Xcel, a youth center in Manhattan’s Jacob Riis housing projects, as an outreach of AGM. Though they couldn’t articulate it then, over time Xcel’s founders discovered that their experience reflected certain core values which they later described as creativity, initiative, resourcefulness, resilience, excellence, and unity. Their mission, also refined later, became empowering young people to achieve their dreams and transform their culture and communities. Then four years ago, ten teens replicated the model and launched Xpress as a creative arts outlet for their peers. In the years since that initial summer of 1996, Xcel consistently drew 75%-80% of its students from PS and MS 34, the public elementary and middle schools across the street at Avenue D and 12th Street. Despite repeated attempts to formalize a relationship with the school and even establish a presence on the campus, their efforts, “pretty much failed beyond the fact that we shared so many students and prayed consistently for the school.” In 2006, Xcel co-founder Jonathan Del Rio and former Xcel program director Dorothy Rivera joined the school’s faculty as dean and a math teacher. Then this year MNYBA awarded AGM, a non-Baptist ministry, a PTT grant, and for the first time, Xcel had something tangible to offer the school. 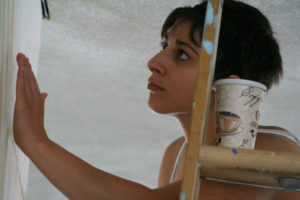 All summer, volunteers from churches throughout the country helped beautify the building’s interior. 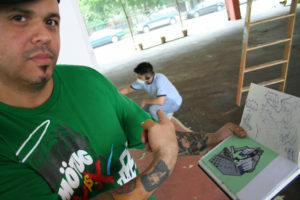 Then one weekend in July, six artists under the direction of legendary graffiti artist NYC Lase, immortalized everything that Xcel represents in the schoolâ€™s playground. Three underground legends including NYC Lase, Duro, and TooFly and three up-and-comers, Ramon Trevino, Lorena Barrezueta, and Kekoa collaborated on four walls and six column surfaces — ten paintings in all. The lone remaining column surface will be painted by students this fall. Collectively, every wall communicates the mission, values, and opportunities that Xcel empowers kids to realize. Generation Xcel’s prayers for eleven years have included becoming a meaningful presence on campus, one that supports and enhances the staff and students and reinforces their capacity to become who God created them to be. Thanks to the generosity of PTT and the tireless efforts of PTT and AGM volunteers, Lase and his crew took the answer to those prayers far beyond Xcel’s wildest expectations. AGM’s adopt-a-school experiment came full circle on Wednesday, September 12, when MS 34 invited Generation Xcel to hold the school’s first middle school assembly in over two years to introduce the meaning behind the murals. Four of the artists and two former students shared about the power of creativity in pursuing one’s dreams — a message inspired “in the beginning” when “God Created” (Genesis 1:1). Once NAMB approved MNYBA’s mini-grant strategy, PTT embarked on a compressed timetable that included recruiting volunteers nationally and equipping local partners to steward their grant resources effectively. + MNYBA and NAMB recruit volunteers from Southern Baptist churches nationwide. + MNYBA engages the Coalition in brainstorming about partnership possibilities. + MNYBA distributes PTT grant application to prospective partners, including Southern Baptist churches and Coalition prospects. + MNYBA reviews and approves partner applications. + MNYBA retains Jeremy Del Rio to monitor PTT and strategize leveraging possibilities. + MNYBA coordinates project logistics with outside partners including: the NYC Department of Education regarding school access, custodial support, and materials; the World Vision Store House regarding in-kind donations of supplies and equipment; Southern Baptist congregations nationally regarding recruiting, training, and housing short-term mission volunteers; and other sponsors. + MNYBA trains local partners in project design, site coordination, volunteer management, and adopt-a-school strategy. + MNYBA assists partners as needed in communicating with local schools. + Project implementation and evaluation. + Project reporting and debrief. MNYBA strategically chose partner ministries representing a wide spectrum of tradition, size, demography and expertise, with the goal of establishing what Rev. Frost called a “community of fellowship” where synergies could be achieved by sharing capacity. On one end of the spectrum were churches like Evergreen (Brooklyn) and Bethsalem (Queens), for whom PTT represented their first evangelistic efforts of this type and magnitude; and on the other were Manhattan churches Graffiti, Abounding Grace, and Manhattan Bible, whose respective decades-long histories are marked by extensive evangelism and holistic outreach strategies. In between were SBC church plants like Crossroads (Staten Island), Gallery (Manhattan), Milburn (New Jersey), and Graffiti 2 (Bronx). The PTT partner ministries unanimously agreed that the support MNYBA provided their individual projects was a critical component in their effectiveness. Pastor Griner of Milburn described them as win/win partnerships. Pastor Perry of Bethsalem echoed those sentiments in describing how MNYBA’s staff helped him “close the deal with the principal,” when his own inexperience and overtaxed staff would likely have not been able to do so alone. Jannie Wolff also noted the accessibility of the PTT staff that made themselves available for questions, on-site visitation, volunteer coordination, and timely assistance in securing project materials. Of particular note are the economies of scale that were achieved as a result of MNYBA’s prior relationship with the central office of school custodians. Coordinating permissions and materials at the Department level streamlined the process at each individual school, and also produced in-kind donations of paint from the DOE. Each church, including the larger ones, struggled to properly staff their respective projects. To this end, the PTT grants were key in providing stipends for coordinators, volunteer recruitment, and back-end administrative support â€“ a fact emphasized repeatedly by each partner ministry. For some churches, inexperience also created difficulties communicating with the school. In such instances, MNYBA staff helped fill the gaps. CitiVision reported a unique challenge operating in a school building that houses four distinct schools. At the outset of the project, two of the school principals consistently disagreed and contradicted one another, a conflict they ultimately resolved among themselves after numerous delays. The volunteers also endured stifling heat working on the building’s fourth floor. Graffiti’s experience navigating PS 64′s bureaucracy was made cumbersome by a skeptical principal concerned about liability insurance and union labor issues. Nonetheless, she allowed PTT volunteers to renovate the main office. Graffiti’s site supervisor Kareem Goubran contrasted PS 64′s slow process with St. Brigid’s Catholic School and Cabrini Nursing Home, where partnerships developed quickly. Kareem also underscored how a basic PTT information packet consisting of a project fact sheet, FAQs including insurance and union guidelines, school testimonies, contact lists, and a letter from the Department of Education might have helped ease PS 64′s concerns. Finally, at least two partners noted that different volunteer groups came with different degrees of preparation and, as a result, inconsistent expectations. As much as possible, PTT must equip volunteers with the necessarily materials to orient them to urban ministry generally and PTT specifically before they arrive. When PTT decentralized this summer, MNYBA signaled a shift in how it would measure effectiveness. The final chapter in PTT’s 2007 story will not be written in this report, and quantifiable metrics like volunteer hours and gallons of paint cannot begin to capture long-term impact. Indeed a more accurate portrait will require a vantage point in the future, such as the year 2020, when this September’s first graders are scheduled to graduate high school. What kind of impact can PTT churches have within a single generation of New York City public school students as a result of prayers prayed and long-term relationships begun with schools this summer? Only time will tell for certain, but dare we expect God to answer the effectual, fervent prayers of those congregations? + PTT’s innovative city-reaching strategy has inspired urban and youth ministry practitioners nationally in venues such as Urban Youth Workers Institute (May); the 150th Anniversary of the Fulton Street Revival (September); the Campus Alliance Executive Team retreat (September); and Embrace Baltimore (October). It has also been reported on various weblogs, with an upcoming feature article in the Tri-State Voice to be syndicated nationally. + In August, the Coalition of Urban Youth Workers received permission from PTT’s former director Eric Hoenigman to incorporate technology architecture and digital resources he developed over the first three years of PTT into a comprehensive, 20/20 Vision Adopt-a-School website. 20/20 Vision refers to: (a) churches’ need to correct their vision of schools to one of partnership in equipping students to become who God has created them to be; and (b) the impact 7,100 churches can make on 1,400 New York City schools within a single generation of incoming public school students, who will graduate high school in the year 20/20. + In September, the Coalition received a grant from the federally-funded, LPAC Transforming Youth Capacity Building Project and a second grant from Student Venture to build and market the 20/20 website, and retained a graphic artist and web developer for the project. + Discussions continue with the Urban Alternative (UA)’s national adopt-a-school initiative exploring how to leverage UA’s resources, PTT’s experience, and the Coalition’s efforts in New York City and beyond. + The New York City Department of Education shakeup continues as school decentralization takes effect this academic year, and principals become accountable for student performance like never before. The shifting political landscape creates a unique opportunity for churches to become a resource to principals, for whom the pressure to deliver academic improvements is at an all-time high. 4) Provide efficient, back-end administrative support including communication resources and coordination of overall PTT proposals, reports, financial accountability, supplies, and volunteers. The emphasis must remain facilitating ministry beyond painting particular school buildings, and the unique role of the coordinating group would be to equip equippers to execute their respective visions for their neighborhoods.